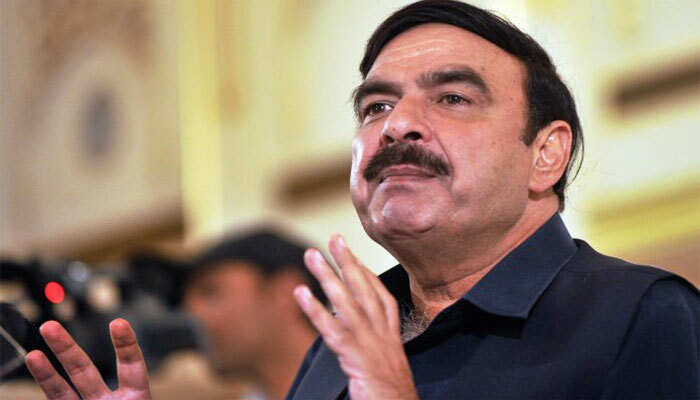 LAHORE: The Minister for Railways, Sheikh Rashid Ahmed, has announced closing down all educational institutions and small industrial units along around 1,700 km long Karachi-Peshawar track of Pakistan Railways to prevent human loss or injury. Addressing a press conference at Railway Headquarters here on Saturday, he said parents of the children playing or roaming on railway tracks should be arrested. He said divisional superintendents would be responsible for clearing railway tracks from unnecessary human interaction. He said it was unfortunate that people used railway track for playing and doing exercises. The minister said the government has come to power when the country was bankrupt because of the corruption of a few. He said like other institutions, railway also faced immense loss. “An engine worth Rs220 million was bought for Rs420 million,” he said while explaining the damage caused to the Pakistan Railways by the PML-N government. He also claimed that railways earnings witnessed an increase of one billion rupees in just 50 days of the new government. He said passenger coaches were a big issue for the railways as many coaches are lying as total wase. He said the Pakistan Railways would strive to bring around 100 coaches on track every month. The minister said separate summaries for regularising 8,000 contract employees and one step upgradation of employees has been sent to the prime minister for approval. He also said Pakistan Railways had formed a task force to make freight trains more functional. The minister said a shuttle train would run from Karachi to Dhabeji and another from Karachi to Hyderabad. He also saidthe fares for Bolan Express from Karachi to Quetta had been reduced from Rs1,100 to Rs700, whereas the fare of a train berth on Akbar Express from Quetta to Lahore had been reduced to Rs800 from Rs1,000.